Can this potent new pill help prevent hair loss in men and women? The hair loss treatment market is worth an estimated £2 billion, and that figure is set to double over the next three to five years. The latest statistics show that up to six in ten men will suffer from some form of hair loss by the time they reach the age of 40. It is little surprise to see an increasing amount of men investing heavily in treatments for baldness. You can find a wide variety of hair loss treatments that vary in different forms. The most common forms include topical solutions such as serums and shampoos, as well as supplements and even hair transplantation surgery. Seeking an effective solution for male pattern baldness can be tricky, especially when you need to consider your budget and your lifestyle. Hair health supplements have become hugely popular with men and women battling alopecia and thinning hair. Many men turn to natural hair supplements as a safe alternative to the FDA approved pill, Finasteride (AKA Propecia), in order to avoid the risks of harsh side-effects. Hair supplements seem to lead the way in performance, and they are now becoming more affordable in an ever growing market place. What are the leading hair supplements? Some of the leading hair supplements on the market include Nutrafol, TRX2, Viviscal, and HR23+. Results will vary with each individual, and all supplements will have their pros and cons in most cases. However, with the competitiveness of the sector, one supplement in particular seems to be standing out from the pack and gaining some promising reviews from male and female users. HR23+, developed in 2014 and officially brought to market in 2015, is the fastest growing supplement of its kind in the UK and throughout Europe. But just what is this popular pill and how effective can it be for preventing hair fall and promoting hair growth? 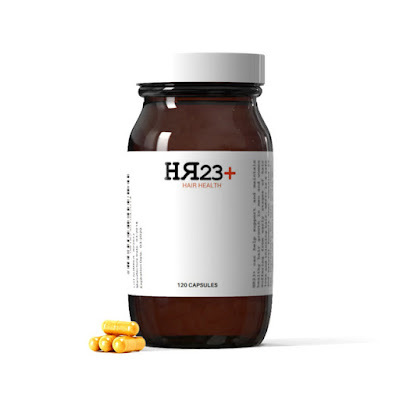 HR23+ hair health supplement is an oral hair growth pill that is made from 23 key active ingredients that can help prevent hair loss and thinning hair. This supplement is safe and free of any side-effects. This latest scientific breakthrough formula contains the popular anti-hair loss ingredient – Saw Palmetto. Functional tests prove that Saw Palmetto can inhibit the formation of DHT. The 23 key ingredients in this supplement are: Retinol, Vitamin C, Vitamin E, Thiamine HCL, Riboflavin, Vitamins B-1 & B-2, Nicotinic Amide, Folic Acid, Biotin, Pantothenic Acid, Zinc, Copper, Choline, Cyclohexane, Para-Aminobenzoic Acid (PABA), L-Cysteine, Silicon Dioxide, Dimethyl Sulfone (MSM), Ginkgo Biloba, Saw Palmetto, Pygeum Africanum, Green Tea, Grape Seed. This carefully considered formula caters for the production of tyrosine, which is important in the maintenance of hair strands and the cells of hair follicles. Vitamin E helps build capillaries and improves the blood flow to the scalp, thus encouraging healthy hair growth, combined with the addition of the B vitamin, inositol, which can speed the rate of hair growth along with other B vitamins that stimulate the process for many of us who are deficient in this nutrient, especially vegans and vegetarians. The hair and nail growth agent, biotin, compliments the DHT-blocking property, saw palmetto - a key combination designed to reduce the pattern of hair fall and increase the rate of hair growth. Vitamin B5 can effectively get vital nutrients to the hair follicle; strengthening it and improving its function. The key combination of choline and inositol work together to form lecithin, a lipid that is needed to form hair cells. Choline helps increase the effectiveness of inositol to protect hair follicle membranes. Silicon dioxide and ginkgo biloba are excellent ingredients that help increase blood circulation, which can stimulate blood flow to the scalp and encourage the growth and maintenance of hair cells. Dimethyl Sulphone has become a popular supplement for the overall function of hair follicles. Although HR23+ is not a cure for baldness, if treated early, this winning supplement can provide an effective solution for men who are concerned about their hair. HR23+ should be used by male or female suffers of early stages of hair loss (Norwood Scale 2-4). Users of this supplement tend to be men aged 21-50 and women 40-50. What can I realistically expect from taking HR23+? HR23+ is specifically designed to treat people that suffer from early stages of pattern baldness. Taking these tablets can increase your chances of preventing alopecia and in some cases can generate new hair cells. Results will vary with each individual, but if you tackle hair loss at an early stage then HR23+ can at least slow down the process and extend your period with a full head of hair. Going by the ingredients and the early reviews of HR23+, this supplement should definitely be considered for sufferers of early stages of hair loss and thinning hair. This supplement has the potential to slow down the rate of hair fall, giving you better peace of mind and an increase in confidence. HR23+ sells at a RRP of £49.90 per bottle (one month supply), which is about right for a premium hair loss treatment. For best results, take HR23+ for a minimum period of three months and see how you get on. A good way to judge the effectiveness of this tablet is to analyse the amount of hair you find on your pillow each morning, or in the shower. You can also purchase HR23+ at Your Next Remedy. Main ingredients: Saw Palmetto Extract, Green Tea Extract, Choline, Vitamins B, Biotin. Specification: 120 capsules/bottle, 30 days supply. Storage: Sealed, keep in shady, cool and dry conditions.